Whether you are looking to host a team retreat, company event or your special day we can accommodate your needs within this peaceful, fun setting. Weddings Include: • Exclusive use of the entire retreat facility during your stay • A comfortable centrally heated lodge with five bedrooms, three baths and 23 beds • 20' x 34' living/meeting room with large stone fireplace (One bundle of firewood is provided. Our Rates and Guest Information page provides information about purchasing more firewood) • "Here comes the bridal party" wedding prep services include hair, make up, nails and massage. These services offered by Oasis Wellness Spa. • No corkage fees! You are able to bring your own alcohol with no additional charges, unlike many venues. This is a huge cost-savings for you! • Venture only hosts one wedding at a time, so you will be able to enjoy our facilities to yourself and know that our staff's attention will be focused solely on your special day. • Stunning natural beauty that will allow you to relax, have fun, and create lasting memories with those you love! • Ceremony site rental and set up up of up simple ceremony chairs. 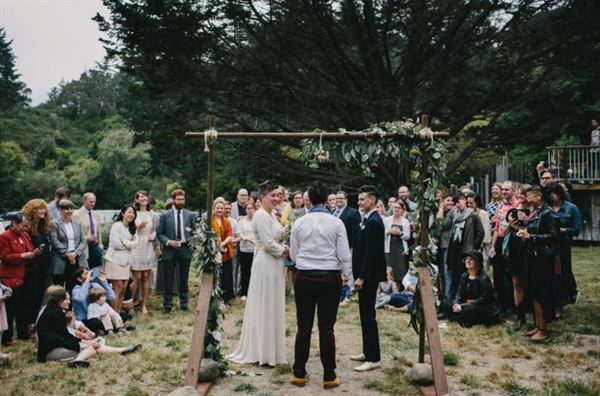 We can accommodate various group sizes of seated guests for a ceremony at the Redwood Meadow or at our poolside ceremony area. • Recommendations for experienced local caterers, event supply rentals (for additional decor, upgraded seating and tables, special lighting, etc), photographers, musicians and DJs, florists, and wedding coordinators. Whether you want to host a formal dinner, a dance-off, a volley-ball game, or a group drum circle, Venture's meadow and blacktop allow for a variety of special events. Venture can provide a referal for event tents and other special event supplies to elevate the atmosphere, or keep it simple and soak up nature and enjoy the tree-lined space.